The two Judges hold up their signs featuring the numbers 1 to 9. If your Judge (on the right) is holding a higher or identical number to the opponent, then you have to attack with the mallet. If you have the lower number then you have to dodge the enemy attack. Each player scores 3 points for a successful attack and 2 points for a successful dodge. The opponent gets 1 point if you dodge when the same numbers are held out, 2 points if you dodge by mistake and 5 points if you attack by mistake. The first player to reach 99 points is the winner. Play against a computer opponent. The computer's reaction time is determined by the countdown before the signs are held up. A game for 2-players. 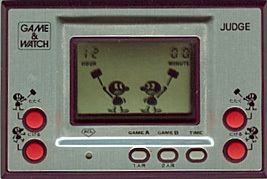 Player I uses the buttons on the left and Player II uses the buttons on the right. Two versions of Judge exist: green and purple editions. The original Japanese release was green, but a fault in the game meant that Player I and Player II received a different number of points when the opponent dodged incorrectly. The purple edition fixed this problem.